« Hurray For Germany’s New Solar Power Record of 22 Gigawatts ! I suspect when the young Aidan Dwyer (of New York) first read this book, Dr. Seuss‘ words must have made a great deal of impression upon his curious mind. 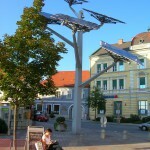 For he subsequently designed/invented (when he reached age thirteen) the solar tree, a decorative means of producing solar energy using multiple solar panels which form the shape of a tree via assistance of poles. This design of solar tree can also double as street lights, producing 50% more power than a flat solar power layout during winter and 20% more power during other seasons. This (Lovegrove’s) Solar Tree installation has an array of LED lit solar pads held up by 20 green stems. The Solar Tree contains embedded artificial intelligence that automatically switches the LED lights on after dark and is smart enough to decipher the appropriate light intensity with consideration of the natural light conditions and the battery’s energy level. Lovegrove’s Solar Tree is designed to work with both on and off grid applications;when connected to a grid, the Tree is able to feed back any excess electricity back into the grid. When connected to an off-grid application, the Tree is able to provide lighting for up to three days before its battery runs flat. Let’s hope the challenges that we face during this time of transition into the renewable energy era will continue to provide us with inspirations for our perceptions of nature, function, and beauty. This entry was posted on Wednesday, May 30th, 2012 at 3:24 AM	and is filed under Business & Opprotunity, Educational. You can follow any responses to this entry through the RSS 2.0 feed. You can leave a response, or trackback from your own site.